Airbrush Tshirts Summer Camp Philadelphia PA, Virginia Beach, Key West Fl Airbrush for Kids Parties and Events! 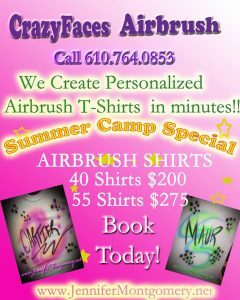 Today lots of lucky kids in Philadelphia PA will be getting airbrush t-shirts as part of their summer camp activity! Airbrush Tshirts are fun for parties and events of all kinds! Each kid will bring their shirt to camp and leave with a custom airbrush design created just for them! 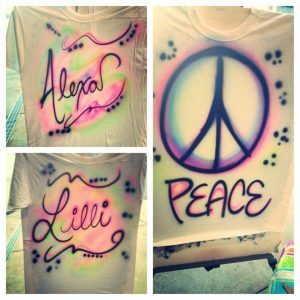 Airbrush is a fun party activity for kids and teens of all ages. Airbrush is especially popular for Bar and Bat Mitzvahs. Guests at Mitzvahs really appreciate having their very own airbrushed t-shirt made for them at the special event. Call Airbrush Artist Jennifer Montgomery of CrazyFaces FacePainting and Body Art at 610.764.0853 to book airbrush for your next party or event in the Philadelphia PA area, Virginia Beach and Key West, FL too. This entry was posted in Airbrush, Parties and Events and tagged airbrush philadelphia, Airbrush Tshirts Party Philadelphia, Airbrush Tshirts Philadelphia, Airbrush Virgina, Bar Mitzvah Airbrush, Bat Mitzvah Airbrush, Kids Birthday Party Philadelphia PA, Kids Birthday Party Virginia Beach, Philadelphia Airbrush Artist, Philadelphia Bar Mitzvah, Philadelphia Bat Mitzvah, Virginia Beach Airbrush, Virginia Beach Bat Mitzvah, Virginia Beach Events. Bookmark the permalink.